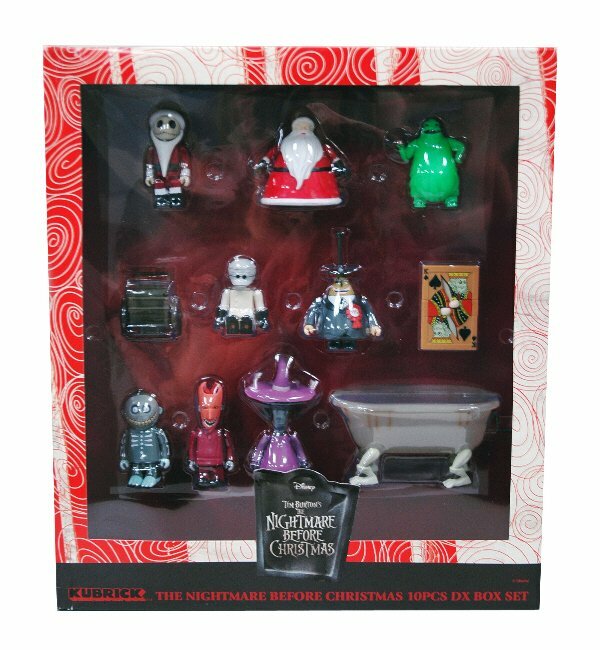 In 2001 a series of Medicom Bearbrick and Kubrick A Nightmare Before Christmas figures were released in five separate sets. Theses figures are composed of 9 bricks / elements: head, torso, hips, two arms, two hands, and two legs which is what the Japanese version of the name, Kyūburikku キューブリック, means. Later they released some of their Be@rbrick A Nightmare Before Christmas figures. The Be@rbrick figures generally are 7 cm in height, which are also term as 100% figures. Other figures are therefore referred to depending on their size compared to a standard figure. So a 50% Be@rbrick is 4cm in height whereas a 200% figure is 14 cm in height. 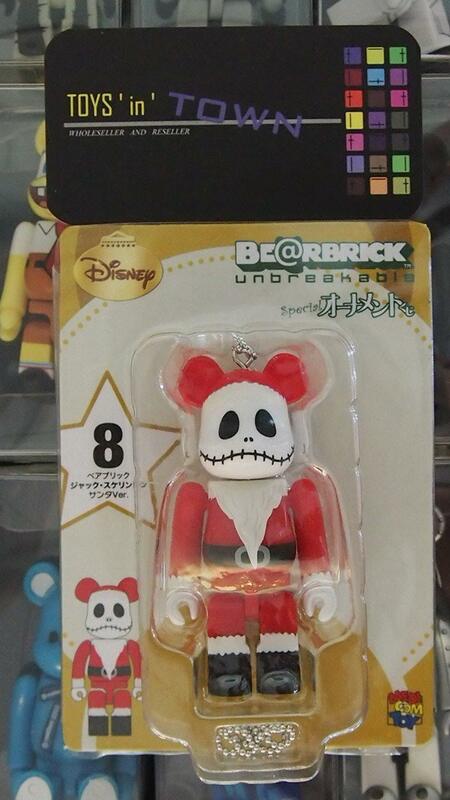 There are also 4 general styles of the standard Medicom Bearbrick 7-inch figures: 1) the basic with 9 parts which all parts can be separated; 2) an unbreakable 100% was launched from Series 14 in 2007; 3) a new kind of BB bearbrick was launched for kids in 2008, all the parts cannot be separated, but the outlook is a bit different, there are 4 screws on the back of the Medicom Bearbrick. 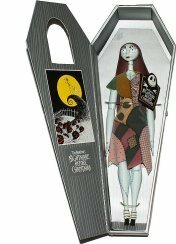 Dec 2005 rerelease of Box set A- Jack Skellington, Sandy Claws, Zero. The white parts are glow-in-the-dark. Dec 2005 rerelease of Box set B- Oogie Boogie, Mayor, Playing Card with swords. The white parts are glow-in-the-dark. Dec 2005 rerelease of Box set C- Santa Jack in sleigh, 2 skeleton reindeer, scary teddy. The white parts are glow-in-the-dark. As well as the Kubrick and Be@rbrick figures Medicom also released two very limited edition Jack Skellington and Ooogie Boogie oversized figures. The Jack Skellington figure, created by Medicom Toy, stood 18 inches high, the exact size used during filmmaking and featured 12 interchangeable soft vinyl heads and an internal brass armature, so he could easily be posed. With a fabric costume over a plush body and injected PVC plastic hands, feet, tie and neck he was displayed in a haunted coffin against a black silk background and with only 1,924 units made retailed for $300 . For those of you who dont know, Oogie Boogie is the main antagonist of the film. Oogie Boogie is the Boogie Man, resembling a large evil burlap sack. He's the only character that is true evil in the film. The figure, especially for Medicom, is amazing standing a full 24" tall and features an articulated armature for posability, including mouth and eyebrow movement. Each piece is crafted in real jute fabric with real thread stitching detail and a weighted bottom for display stability.